A123 Systems, manufacturer of advanced Nanophosphate™ lithium ion batteries and systems, today announced the grand opening of the largest lithium ion automotive battery production facility in North America, based on available data. The new plant in Livonia, Mich. is expected to expand A123's manufacturing capabilities by up to 600MW hours per year when fully operational, contributing to the company's plan to expand global final cell assembly capacity to more than 760MW hours annually by the end of 2011. The opening of the Livonia factory comes just over one year after A123 was awarded a $249 million grant from the U.S. Department of Energy (DOE) as part of the American Recovery and Reinvestment Act to help the company execute its strategy to ramp up U.S. manufacturing capabilities to meet increasing, market-driven demand for its innovative technologies. "When I signed Michigan's first-in-the-nation battery tax credits into law, it signaled my administration's intent to make our state the advanced battery capital of the world," said Michigan Gov. Jennifer M. Granholm. "This set the stage for the tremendous collaboration between A123, the Department of Energy, the Michigan Economic Development Corporation and state officials that led to this state-of-the-art battery manufacturing facility in Livonia. We applaud A123 for selecting Michigan as the center of its U.S. manufacturing, creating new jobs and helping diversify our economy." 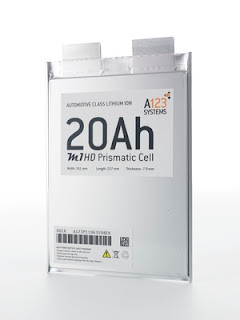 A123's advanced lithium ion batteries and systems are designed to help customers quickly and cost-effectively take game-changing solutions from conception to commercialization. 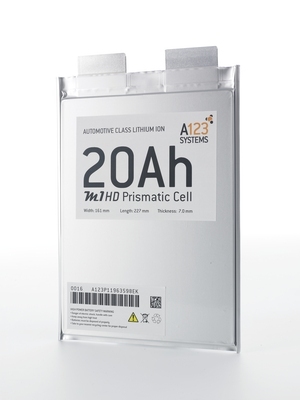 A123 is the first major U.S.-based battery manufacturer to receive TS 16949 certification for its cylindrical lithium ion cells for automotive applications, validating that the company's product design and manufacturing processes meet the highest standards for excellence in the automotive industry. A123's growing list of customers includes BAE, Eaton, Fisker, Navistar, Shanghai Automotive Industry Corporation (SAIC) and other global automakers and heavy-duty vehicle manufacturers. The company's innovative technologies are also being implemented in a wide variety of commercial products, and the company has also delivered more than 20MW of its Smart Grid Stabilization Systems (SGSS) to customers worldwide, making A123 the world's largest producer of lithium ion batteries for ancillary services for the power grid. Congratulations for David Vieau and A123 team. In a country that strives, like USA, to modify its energetic matrix for becoming definitely independent of fossil fuel and still has the best scientists and researchers in the world, supplying their scientific and technological needs, the result could not be different. I hope Detroit becomes now the world capital of electric car, and that the strong american economy may be pioneer in presenting to the world, new solutions, the quickly as possible, for the crucial question of batteries.